Less than two weeks after drawing criticism for giving reigning American League Cy Young Award winner Blake Snell a $15,500 raise, the Tampa Bay Rays on Wednesday announced they're giving their ace quite a bit more, after all. Confirming reports earlier in the day, the club announced it agreed to terms with the left-handed Snell on a five-year, $50 million contract that runs through the 2023 season, which would have been Snell's first year of free agency. The deal could pay an additional $2 million in incentives, the club said. According to the Rays, it is the largest contract ever given to a pitcher before reaching arbitration, topping the $42 million in total value Gio Gonzalez got from Washington in 2012, and could top the $10 million average value the New York Yankees gave Luis Severino earlier this offseason. "Since being drafted in 2011, Blake's talent and hard work have enabled him to establish himself as one of the most dominant pitchers in the game," Rays principal owner Stuart Sternberg said in a release. "We're looking forward to seeing him take the mound for the Rays for years to come." Snell, 26, had one of the most dominant seasons in recent memory in 2018. He went 21-5 with a 1.89 earned-run average with 221 strikeouts in 180 2/3 innings over 31 starts. His wins and ERA led the AL and set club records. His ERA was the lowest by an AL starter since Pedro Martinez in 2000. His 1.27 home ERA is the lowest in the AL since Nolan Ryan's 1.07 mark with the California Angels in 1972. He became the second Rays pitcher to win the Cy Young, joining David Price (2012). He became the youngest Cy Young winner since Clayton Kershaw in 2013 and the youngest in the AL since Felix Hernandez in 2010. 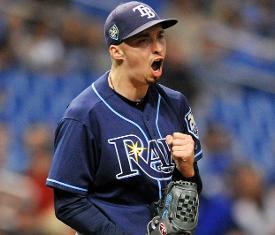 A first-round pick by the Rays in 2011, Snell is 32-20 with a 2.95 ERA in three seasons. He will make his first career Opening Day start this season, and will do so for a team coming off a 90-win season and entering 2019 with playoff aspirations. Earlier this month, the Rays renewed Snell at $573,700 for this season, a raise of just $15,500. As Snell is not yet eligible for arbitration, the Rays could assign him a salary for 2019 without his approval.